Where does your self-image come from? If your opinion of yourself often comes from what people say to you and how they treat you, then perhaps you will find this idea helpful. Imagine yourself as a blank canvas. When you hear negative comments, if you take them to heart and start to believe them, you are letting others splash paint on your canvas. They can make of you what they like; your sense of who you are is then defined by other people’s opinions. This is their arrogance winning over your confidence; it leaves you confused, doubting, miserable and self-loathing. You are allowing them to tell you who you are. You have no control and no significance in your own life. Truthfully, your canvas is not blank. You are covered in complex painted images, accumulated throughout your life. You are a painting, complex and unique in your own way. 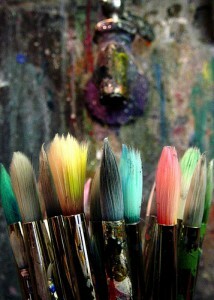 You are the only one who holds the paintbrush, because your self-esteem is all in your own mind. The only one who is living your life, the only one who has the right to decide what you are is you. People may mistake you for a blank canvas but that simply isn’t true. You are a complete painting already, with your own talents, interests, values and thoughts. All paintings invite interpretation. That’s as far as others can go; they can interpret you, but they cannot change what’s on your canvas. Art critics are not painters. Some people enjoy portraits, some enjoy nature scenes. Just because someone does not understand or appreciate your personality, they do not change you. You are no less valuable. Some people hate Picasso’s paintings but he is still one of the greatest artists in history. His work speaks for itself. What’s on your canvas? What do you believe in, what are you good at and what have you done in your life? Nobody can change those things. Frame your painting, study it, and own it. It’s the only one of its kind. Tagged advice, life coaching, self-esteem. Bookmark the permalink.